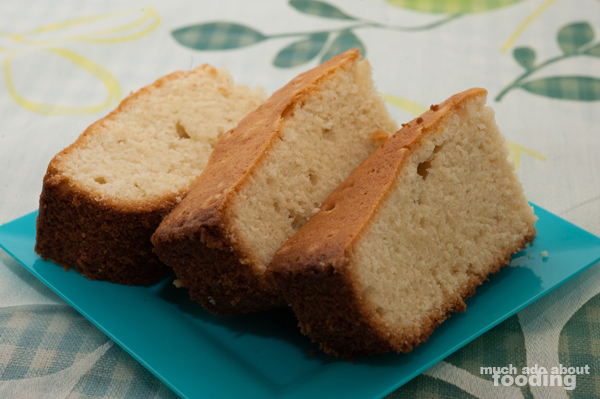 What I first remember about pound cake was that it was always a special treat that my mom gave us kids when she had the right coupon or the right sale was on at the grocery store. We always had the Sara Lee one that came in the freezer section of Ralph's or Albertsons (though manly Ralph's). Aside from how dense the cake was and cold, the favorite part by all of us was the brown, peelable "crust" surrounding the loaf. There was something about it that made the section so desirable - perhaps it was its different-ness. When amaretto became the latest of our Test Kitchen ingredients, I saw plenty of your suggestions to use it in a dessert. The pairing of it with fresh fruits came up often, leading me to think of what else fruit goes well with. Pound cake jumped to mind, and the almond flavor of amaretto just made sense. So, we went with eating this without accoutrements but you can certainly toss on some fresh berries! 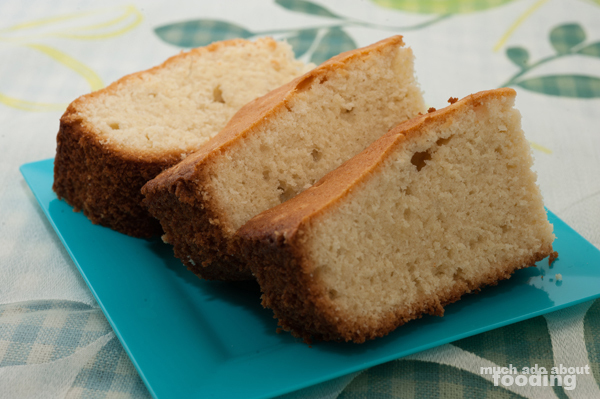 Otherwise, enjoy a dense, moist almond-tasting pound cake made adult via liqueur! If you don't have time on your side to soften butter slowly via room temperature, just slice it up into smaller pieces for greater surface area. Mix together with softened cream cheese until smooth. Add sugar slowly as you're mixing to bring mixture to fluffiness. Then add amaretto and vanilla extract. Preheat oven to 325°F. Gradually beat flour into wet mixture. The batter will seem dry afterward. Beat in eggs one by one until a smooth batter is formed. Because of the amount of butter used, you will not need to grease up your baking container. I used a 9"x13" baking dish but feel free to use a 12-cup bundt pan for a prettier pound cake. Pour batter into dish, and bake on the middle rack for 55-60 minutes. It will be done once you've inserted a toothpick through the thickest part, and it comes out clean. Enjoy! 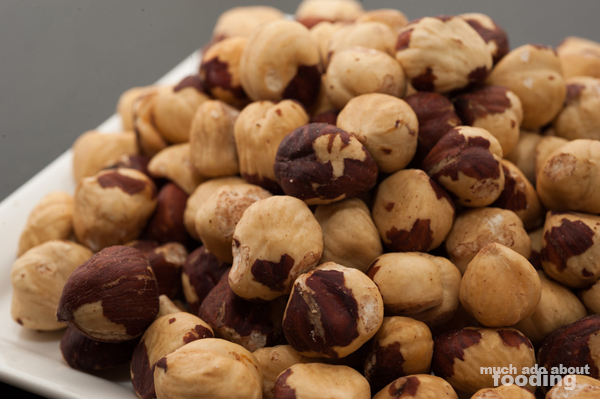 We came into possession of some hefty and beautiful hazelnuts at the Portland Farmers' Market at PSU during our trip in April. They were handing out samples, and I really fell in love with the taste so finished our visit of the booth by purchasing a one pound bag of the stuff. I'm open to your suggestions on what we should do with these lovelies. Any thoughts?